Syria's four main intelligence services are (or were) directly under the control of the Syrian president and have overlapping functions so that the regime is not overly dependent on any one of them. Each operates in near total secrecy (most of the information below was compiled by MEIB from scattered reports in the Arab press and interviews with knowledgable Syrian sources). None of the services are permitted full access to information about all of its counterparts or the identities of agents working in the other services. Even within each service, commanders of different divisions often reported directly to Assad, rather than to their nominal superiors. Whether the intelligence chiefs will show Bashar the same kind of unquestioned loyalty is anyone's guess. The Political Security Directorate (PSD) is responsible for detecting signs of organized political activity that run counter to the interests of the regime. This involves surveillance of suspected political dissidents, as well as the activities of foreigners residing in the country and their interaction with locals. The PSD also monitors all print and audiovisual media. The commander of the PSI is Maj. Gen. Adnan Badr Hassan, an Alawite from Homs. He has held this position since 1987. The General Security Directorate (GSD) is the main civilian intelligence service in Syria. It is divided into three branches. The internal security division is responsible for internal surveillance of the population in general--a duty which clearly overlaps with that of the PSI. The purpose of this redundancy, notes one prominent scholar of the Ba'athist regime, is to ensure that Assad "has always in the security field two strings to his bow . . . acting in a manner not unlike that of Napoleon, who pressed into service a secret police under Fouché and simultaneously organized a counterpolice to check on Fouché. "1 The other two divisions of the GSD are external security (equivalent to the CIA) and the Palestine division, which monitors the activities of Palestinian groups in Syria and Lebanon. The director of the GSD is Maj. Gen Ali Houri, a member of the Ismaili sect of Shi'ite Islam.2 It is noteworthy that until Houri's appointment last year, this position had always been held by a member of the Sunni Muslim community. 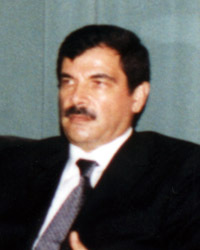 The dismissal of Houri's predecessor, Lt. Gen. Bashir al-Najjar, in July 1998 (and his subsequent imprisonment on corruption charges) was part of a larger trend over the past two years of removing the relatively few Sunnis who held top posts in the security apparatus.3 The deputy chief of the GSD, Muhammad Nassif, is a retired military officer who heads the powerful Alawite Khayr Bek clan. Nassif had been a central figure in relations with Iran and Lebanese Shi'ite militias in south Lebanon for quite some time and formerly headed the internal security division of the GSD. The current head of internal security for the GSD is Bahjat Suleiman, a key political advisor to Bashar Assad who was appointed to this position last year. It is unclear who heads the external security division. One source contacted by MEIB said that Gen. Ghazi Kanaan, the head of Syrian military intelligence in Lebanon, currently occupies this position. While this is plausible in light of Kanaan's presence at Syrian-Turkish security talks last year, we've been unable to confirm this claim. The head of the Palestine division was last reported to be Hisham Bakhtiar, but this information is two years old. It is difficult to establish with certainty the current occupants of these two positions because these divisions are rarely mentioned in the Syrian press. Syria's military intelligence service, headquartered at the Defense Ministry complex in Damascus, is formally responsible for the usual range of military surveillance operations, planning, etc. that one would expect. In addition, it is responsible for providing military and logistical support to Palestinian, Lebanese, and Turkish extremist groups, monitoring (and often assassinating) political dissidents abroad, and coordinating the activities of Syrian and Lebanese military forces stationed in Lebanon. The current head of military intelligence is Gen. Hassan Khalil, 63, who was appointed to this position five months ago to replace Gen. Ali Douba. Khalil, an Alawite from Latakia, had served as Douba's deputy since 1993. MEIB has learned from informed sources, however, that the main decision-maker in this service is not Khalil, but the recently-appointed deputy chief of military intelligence, Gen. Assef Shawkat. Shawkat, also an Alawite, is the husband of Bashar Assad's older sister Bushra. Despite its name, this intelligence service is not primarily concerned with providing information to the air force. It's evolution into Syria's most secretive and fearsome intelligence service has a great deal to do with the fact that Hafez Assad was once commander of Syria's air force. After he assumed power in 1970, Assad turned to this intelligence service, dominated by men that he knew well (and in most cases had appointed himself), to undertake sensitive domestic and international operations. For nearly thirty years, the service was commanded by Maj. Gen. Muhammad al-Khouli, a trusted advisor whose office was adjacent to Assad's in the presidential palace. On the domestic level, Syrian air force intelligence has frequently spearheaded operations against Islamist opposition elements in the country. It played a leading role in the regime's suppression of Muslim Brotherhood revolt during the 1970's and early 1980's. More recently, air force intelligence agents reportedly led the nationwide manhunt for members of the Islamic Liberation Party (Hizb al-Tahrir) in December 1999. Gen. Ibrahim Hueiji, the current head of air force intelligence, is an Alawite from the Haddadin tribe. He was elected to the Ba'ath party's central committee on June 17. 1 Hanna Batatu, Syria's Peasantry, the Descendants of Its Rural Notables, and Their Politics (Princeton University Press, 1999), p. 240. 2 The Ismailis (sometimes called the "Seveners" because they recognize only seven imams rather than twelve), split from orthodox Shi'ite Islam in the eighth century, They constitute about 1% of the population of Syria. Much like the Alawite minority in Syria, who constitute 11% of the population, the Ismailis have historically feared Sunni Muslim dominance and have thus tended to be very supportive of the Assad regime. 3 In 1998, it was widely reported in the Arab press that Lt. Gen. Mahmoud Shaqa was appointed to this position (see, for example, Al-Quds Al-Arabi, 6 July 1998), but these reports were erroneous. 4 Declassified files of the East German Stasi intelligence agency have recently shed light on the involvement of Syrian intelligence in other terrorist attacks overseas, most notably the 1983 bombing of a Frech Cultural Center in West Berlin. See Daniel Pipes, Syria Beyond the Peace Process (Washington, DC: Washington Institute for Near East Policy, 1996), p. 115.